This apparatus is designed to demonstrate Ohms Law. Consisting of a sheet metal enclosure with milliammeter, voltmeter, rheostat, push key and terminal posts.. Simply connect an external battery and a suitable resistance to the terminal posts, then press the push key. Readings are taken from the milliammeter and voltmeter and the resistance is calculated using Ohms Law. 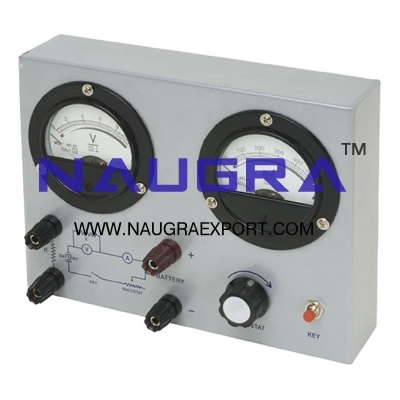 We are leading manufacturers, suppliers & exporters of Ohms Law Apparatus for Physics Lab. Contact us to get high quality designed Ohms Law Apparatus for Physics Lab for schools, colleges, universities, research labs, laboratories and various industries. We accept bulk orders for government tenders in all countries around the globe. For similar products visit at main page of Electronics Lab Experiments.